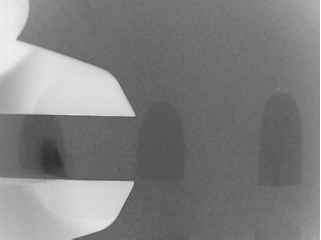 Whilst X-rays can be used to accurately locate a missile, they cannot be used to precisely measure the calibre of a missile as all X-ray images, by virtue of the way they are taken, are magnified to some degree. As the distance from X-ray plate to the missile increases, so does this magnification effect. These problems can be offset by taking two X-ray photographs of the body, one face on and one side on. These can then be used to estimate the depth of the missile in the body. 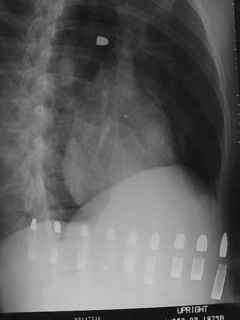 A number of bullets of different calibres can then be placed alongside the body at a suitable position and then X-rayed (Figures 5.1-5.3) to estimate the bullet calibre. 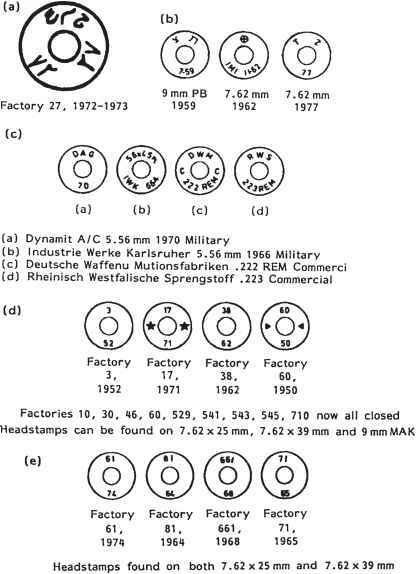 Alternatively, a micrometer, with its jaws open to a set measurement, can be placed in the appropriate position (Figure 5.4) and can be used to estimate the calibre. Figure 5.1 Bullet deep in the body. Photograph reproduced by permission of Evan Thompson. Figure 5.2 Bullets being placed in an appropriate position. Photograph reproduced by permission of Evan Thompson. Figure 5.3 Bullet calibre comparison. Photograph reproduced by permission of Evan Thompson. Figure 5.4 Example of how a micrometer can be used to estimate a bullet's calibre. calibre. 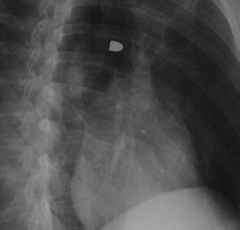 Whatever bullet calibre is closest in size to that on the X-ray must be the largest calibre of bullet that the bullet in the body can possibly be. For example, if the image is the same size as a 0.25" calibre bullet, then the bullet in the body must be of a smaller calibre than 0.25".